Effective 1-Ingredient Gum Disease Remedy – Honey! Does honey as a gum disease remedy sound ridiculous to you, when we are always advised to stay away from excessive sweet stuff if we want to keep our teeth strong and healthy? Not at all if you know that honey is a good antimicrobial and is found to have an application for treating gum diseases effectively. Research has shown that honey contains an enzyme that produces hydrogen peroxide which is believed to be the key reason for the antimicrobial activity of honey. Honey not only curbs dental plaque bacteria growth but also reduces the amount of acid produced, which stops the bacteria from producing dextran, a component of dental plaque that adheres stubbornly to the surface of the teeth. Honey derived from the abundant Manuka bush in New Zealand, claims the strongest potency of antimicrobial properties. In addition to the usual hydrogen peroxide anti-bacterial activity, Manuka honey has Unique Manuka Factor (UMF), making it doubly potent. UMF honey is found to be more effective than hydrogen peroxide against some types of bacteria in laboratory testing and proven to be as good as the standard antiseptic phenol. The antibacterial factor in Manuka is unaffected by enzymes in the body that breaks down hydrogen peroxide components. Other types of "active honey" include Rewarewa and Wild Flora. So, how do you use honey to treat gum disease? Scientists are exploring the option of using Manuka honey diluted as a mouthwash or even including it in toothpaste. And meanwhile, if you are game to try, just rub it into the gums after brushing your teeth! 1. All about propolis: The Natural Antibiotic. 2. Propolis toothpaste helps fight bacteria, prevent tooth decay, heal bleeding gums, and prevent receding gums. Details in: Propolis Toothpaste - Nature's Answer to Oral Diseases. 3. For propolis products such as propolis capsules and candies, check out Bee Healthy. 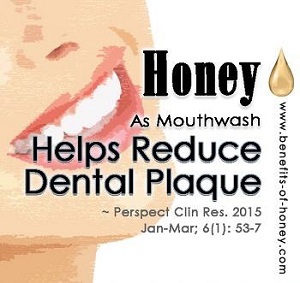 End of "Effective 1-Ingredient Gum Disease Remedy – Honey!". Back to "Alternative Medicine: What Your Doctors Don't Know".